s p a c i n g : : : whose space is public space? There are secrets under our feet. Networks of streams and creeks and once-yawning ravines, which were long ago deemed unnecessary, unwanted and better-off hidden, now lie blanketed by roads and parks in Toronto’s downtown. Garrison Creek, one such waterway that was buried alive, is haunted by eerie markers of the structures that straddled its current — the skeletal ghosts of old bridges themselves. Few pedestrians are aware of what lies beneath them as they walk on Crawford Street, just below Dundas, along the edge of Trinity-Bellwoods Park. There are clues suggesting that something is strange: parallel thick concrete curbs running the outer borders of the sidewalks for an unexplained stretch, the small rusted roots of a long-gone railing quietly appearing every few feet on the inner edges of the walkways. Couples with dogs and strollers cross Crawford towards the main body of the park not realizing that, if they step over the curb onto the grass, less than a hundred years ago they’d have been walking on air. The Crawford Street Bridge (above image) was built in 1915 over a ravine that provided passage for Garrison Creek. Its three dramatic arches and ornate balustrades provided an appropriate complement to the architecture of the original Trinity College (which lay just south of it) and to the Victorian homes on the park’s perimeter. But by the middle of the century, that neighbourhood had changed. Trinity College was demolished in the early 50s, the community became more working class, and the houses increasingly run-down. When the Bloor-Danforth subway line was being built in the 60s, all the debris and the dirt that was excavated needed a place to go and city officials, sensing that they’d get little reaction from the essentially voiceless Trinity-Bellwoods community, chose to dump the rubble there. The ravine below the Crawford Street Bridge was filled, and thus the bridge itself rendered futile. There’s now a sense of amputation, of robbery, when standing on the bridge. Scars from where its railings were torn off have never healed, and the broken, crumbled ends of the curbs suggest an intense disrespect for the regality that lies beneath the surface. And yet, there is little to remind us of what remains under the silent and wounded concrete — unlike its counterpart a few blocks to the north. The Harbord Street Bridge, built in 1905 and buried in 1930 to make way for development, is a peculiar remnant of Toronto’s past which seems to recognize its own incongruity. Running along the south end of Bickford Park between Crawford and Grace Streets, the bridge provides its own tombstone — the exposed balustrade, decorated with graffiti and crumbling in parts, is uneven and sloping against the sidewalk it borders. Its western edge is engulfed by earth and grass as though it has attempted to sink quietly away into the ground of the park to be lost and forgotten like the rest of the structure. 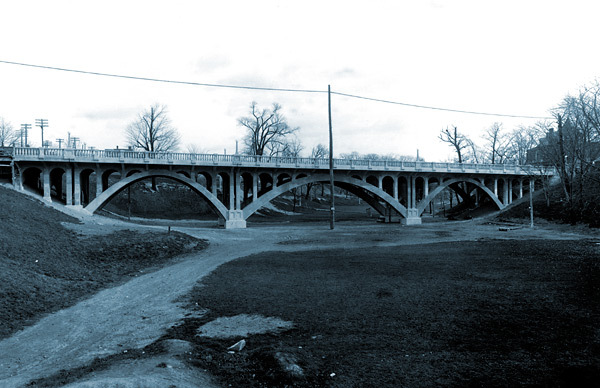 The Harbord Street bridge, like Crawford’s, provided a route for early Torontonians to pass over Garrison Creek. The silent concrete of the two hidden structures now remains to evoke images of our city’s past for any who will allow their curious minds to seep beneath the surface.